Adults at the J events are geared towards adults who are 18 years and over. Enjoy fun group outings to sporting events, shows, and museums. Enjoy behind-the-scenes culinary events and a variety of programs that promote personal enrichment, enhancement of new skills, creative expression, and social connections. 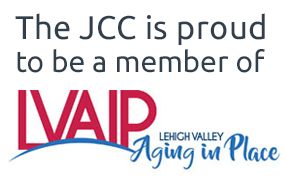 For more information, or to register for events, please call 610.435.3571 or stop by the JCC Welcome Desk. In this class you will learn all of the skills needed to create your own beautiful mosaic art. Instructor Cindy Schneider will teach participants how to safely handle glass and how to use appropriate glass cutting tools. Whatever your art level, Cindy will support and encourage you to grow as an artist and designer. All materials are included in this course. Aqua Jogging is a unique exercise class that used aqua belt flotation devices to allow the swimmer to run in place in the water. This exercise is designed to help improve strength, endurance, and cardiovascular health through non-impact water resistance methods. Activate your urge for variety! Silver Splash offers fun, shallow-water movement to improve agility and flexibility while addressing cardiovascular, strength and endurance conditioning. No swimming ability is required, and a Silver Sneakers kickboard or other aquatic equipment is used to improve strength, balance, and coordination. Water aerobics is often considered a low-intensity workout program appropriate only for pregnant women or the elderly. However, water aerobics actually offers multiple benefits for swimmers of any fitness level. Aqua aerobic exercise can help increase your energy, flexibility, stamina, and strength. A certified instructor will guide the class through balance and gentle stretching poses. Your very own “Connection Corner at the J.” Join other adults to experience similar interests such as Yiddish, mah jongg, knitting, recipe exchange, current events, tech talk, etc. This is a time to connect with others. The JCC will provide the space and light refreshments. Register for the year and participate in as many of the weekly “Connection Corners” as you would like. Click here for a full list of weekly activities.